Discussion in 'Help Pad' started by berniek, Jan 6, 2017. There is spam posted by a new user "Antoshkahef" as a status update. Is there a way to easily and quickly let any mods know about spam? Yes, you can use the Report feature at the bottom of each post to let us know about spam. Is it wrong that I kind of wanted to try out the "report" feature by clicking it under your post Laura? @lmccandless Lol! bestcee and jk703 like this. hahahaha - i honestly don't know what would happen? but maybe we better not try! That's the conclusion I finally came to. What if I accidentally banned you and you couldn't get back in to fix it! That would be awful! Ok, you gals are toooooo funny!!!! But, I don't see a report feature at the bottom of each post???? I see LIKE; TOGGLE MULTI QUOTE; and QUOTE POST??? Good thing, because I was going to report both of you for mis-behavin' !! i bet it's pollys/admin only that can see the Report feature. Is there anything in the bottom left of your posts? Right next to your name, the time you posted, and x Delete. There's a triangle with an exclamation mark in it and the word "Report." I love to report things, like mispelling to the admin, smoking in the gallery and other very reportable things, and I once did a report on Abraham Lincoln. mimisgirl, patsyt, Iowan and 5 others like this. Not for us ordinary folks. I'd use it too much to report Anne's crazy sarcasm. She is so much better at it than I am and it makes me jealous. I should have written you to ask for reports when I was in school. 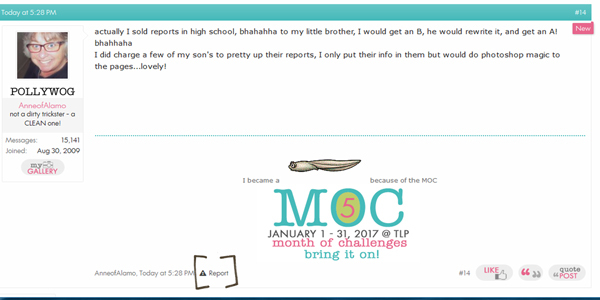 actually I sold reports in high school, bhahahha to my little brother, I would get an B, he would rewrite it, and get an A! I did charge a few of my son's to pretty up their reports, I only put their info in them but would do photoshop magic to the pages...lovely! Oh now I find out. Of course the horribly long week of reading article after article and taking quizzes to make sure I understood probably would frown on it. At least your brother rewrote it a bit. @AnneofAlamo is just full of mischief wherever she is! but darn, I can't report her either! Maybe I am 1) a Polly (and no one has told me ha ha), or 2) a Super User (ah, no), or 3) special (I doubt it), or 4) a newer user (maybe) -- I can report all of these posts. Using this little report link.